What if you could replace the flooring in your home one time and then never have to replace it again? With our hardwood flooring in Bel Air, MD, that dream will be a reality. 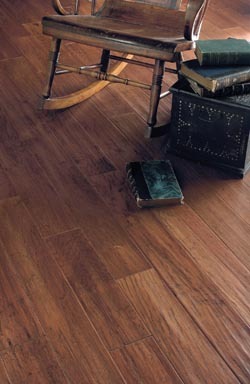 Hardwood has long been the flooring of choice for homeowners, regardless of their interior decor. It’s the ultimate choice whether you live in a 10,000-square-foot estate or a 1,200-square- foot family home. Hardwoods can be dressed up or down depending on your furniture selection as wood flooring combines timeless elegance with a rustic charm that appeals to just about anyone. Is a hardwood flooring installation really the last flooring you will ever have to buy? It very well may be. This is because solid hardwood flooring has the ability to be refinished. When wood gets damaged and shows signs of age, wear, and tear; the damage can be easily erased by sanding down the surface and adding new stain. Like the phoenix rising from the ashes, an old worn down floor is able to look like new again, for a small fraction of the cost of new flooring. The main key to making sure you have quality wood floors that last is starting with a quality installation. When installing hardwood, it is important to make sure every piece is cut exactly and the subfloor is prepared properly. These require skill, precision, and experience. At our store, we provide you with the professional installation team to make sure the job is done right. No project is ever too big or small for our experienced crew, whether your home is 1,000 square feet or 10,000. Pay us a visit today and take a look at our wide selection of hardwood floors. We can have your dream flooring installed in no time. Contact us to learn more about our quality hardwood flooring. We serve residents of Bel Air, Fallston, Forest Hill, Abingdon, and Kingsville, Maryland, as well as the surrounding communities.